92mm jaw opening makes the impossible job possible. 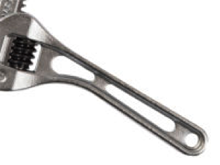 Have you ended up scratching the surface of large nut, fitting, or valve by using pipe wrench because you didn’t have any wrench for it? 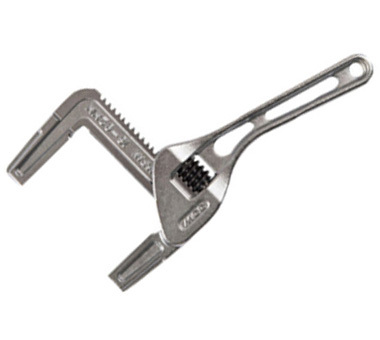 This wrench enables you to tighten those large size without scratch on surface. Clean finish makes it look professional. 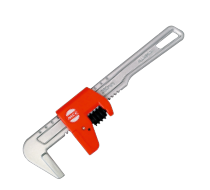 Suitable for all sizes from small to extra large size of nut, fitting, valve even where the conventional adjustable wrench can't handle. Outside jaw can be also used for drain trap that is often used in kitchen and bathroom floor drain. 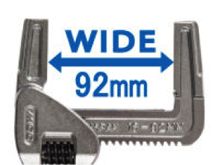 In order to cover any common size of thread fitting in daily plumbing work, this new product was given the extra wide opening jaw to open up 92mm, which you don’t normally find in the store. It comes with the product when you purchase. 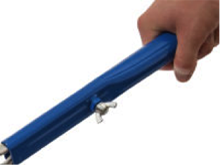 The Extension handle provides a higher leverage without any additional effort. When it comes to larger size of fitting, this handle definitely do the job for you. 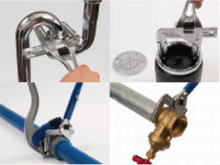 Forging steel handle with a high quality of special raw material made it strong enough to stand up to daily plumbing work, yet light for easy operation and handling.